You would be surprised when you know how many people die each year and injured from falling down the stairs. particular risk are the elderly and young children. In fact, one wrong step can be critical. However, you can reduce their dangerous, in this article we will write about some of the factors in its construction to be safe ladder. If the house two or more floors, the staircase is an important element. there are many materials such as metal, wood and glass,but they must be designed with security standpoint. This aspect is often overlooked and as a result, you have a very slippery surface. These stairs are dangerous even for an adult, let alone a child who has run headlong at home. Also, remember that most members of the family walks around the house in socks, which in contact with a smooth surface, increase the risk of slipping. Therefore, steps must have a tread which will reduce the likelihood of slipping. Coverage levels are made of different materials - this rubber, metal, polypropylene, fabric and many other materials. A number of finishes are cheaper and easier to use than installing carpet. However, all coatings must not only be safe in terms of your home and functional stairs, but add good look in the interior. When the most important question with steps resolved there are two other important questions - is stair lighting and handrails. Handrails shall be well secured, besides their height should be appropriate. Stairs should be well lit, and shall be located at both the top and bottom of the stairs. Many people have adequate lighting, but decided to use the stairs in the dark, so as not to wake the other family members. It's pretty dangerous, but today in this cases there is a special muted lighting levels. Other dangerous moments that are the cause of injuries on the stairs - is failure. Should always ensure that carpet was in good condition, stage did not drop, handrails are not swayed, and so on. Your stairs will be safe but be sure to check the quality of your stairs, because it determines the health of you and your family. 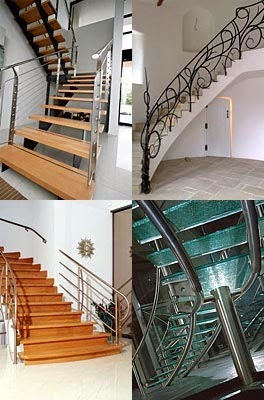 stairs designs team wishes you maximum safety in your home. in Detail : metal stairs in House "C"